Skyway Holdings is a family owned, full-service transportation and logistics company consisting of two main divisions: MDS Trucking and Skyway Brokerage. MDS is an asset-based carrier providing shipping services throughout the Continental United States with a large fleet of power units and a variety of trailer equipment, while Skyway operates as a third-party logistics company. As a 3PL, outside of MDS, Skyway provides its customers access to thousands of contracted carriers nationwide. By integrating our logistics and asset companies, we improve customer service and significantly lower shipping costs. Reliability has been our reputation since day one, and the ability to sustain the growing needs of our customers is unprecedented. In 2005, Mike and Daniel Vuckovic started a small trucking company in the Western Suburbs of Chicago. Their hard work and reliability landed them a small contract with Empire Today, one of the largest flooring retailers in the United States. Based on performance and dependability, Empire extended additional lanes. By 2010, Skyway was the exclusive shipping and logistics provider for Empire's transportation needs. What started as a small owner-operated company has grown exponentially and consistently into one of Midwest's premier transportation and logistics companies. At Skyway Holdings we treat each shipment as if it were our own. MDS Trucking is recognized as a leader in on-time shipping and safety performance and ranks among the most reliable freight carriers in the nation. 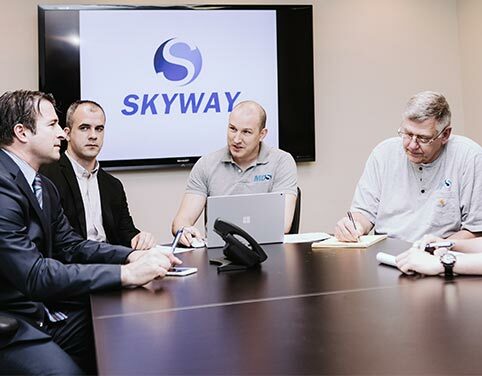 Powered by technology and people, Skyway Brokerage exclusively manages large corporate accounts from across the country. We provide logistics solutions , regardless of size, and are dedicated to achieving the highest level of service for our customers. Skyway Brokerage conducts frequent and extensive market surveys, ensuring our customers receive competitive shipping rates. Request a quote or name your own price, and our experienced pricing specialists will contact you immediately. Contact us today to discover the Skyway difference.